The News has been updated. You can now comment on the latest site news. This feature is for your comments, feedback, opinions or any discussion about the news post. Using the comments to post SPAM, to chat off topic or "race" to be the first comment will result in Chat bans and fines. Please do not abuse this. The Sybri can also wear the Prize Costume. The Walk of Fame has been released in Lowlyhood. This is the new home for our celebrity dress up games. From time to time, we will select famous people that live far away from Marada and immitate their clothing, shoes and hair styles. They will be added to the site for you to wear - with the majority avaliable for FREE at the Clothing Rack. There are 3 new Miley Cyrus hair styles avaliable. This week is Double Gym Stats Week! Every Gym and Elite Gym session that you complete this week will give you double the normal amount of stats for the same normal cost! All Quests have been updated. They are all now more profitable. The Job Centre in the City of Marada has been improved. The Ice Fairy mystery item game is back! A new Weekly Quest Challenge has just started. This week's quest game is Secret Santa. The challenge is to complete as many of these Quests this week. The top 3 players at the end of the challenge will receive a Super Hero Costume, 200,000MP and a Gold Trophy, the next 6 players will receive 150,000MP and a Silver Trophy and the next 9 players will receive 100,000MP and a Bronze Trophy. Here is a preview of a new Prize Costume that will be released later this week, with the new Capsule Machine in Nimbus. The Crikey, Crindol, Fasoro, Nino, Rofling, Vlad, Yuni and Zola are the first pets to wear this costume. Introducing our 71st species of Marapet. The Zola is a restricted pet that will be released shortly, as part of the new Capsule Machine in Nimbus. A new Weekly Battle Challenge has just started. This week's opponent is Devil, you will need to have a Devil Trading Card in your Battle Deck. The challenge is to win as many battles against this opponent this week. The top 3 players at the end of the challenge will receive a Acne Trading Card, 200,000MP and a Gold Trophy, the next 6 players will receive 150,000MP and a Silver Trophy and the next 9 players will receive 100,000MP and a Bronze Trophy. The Leprechaun quest in Gigantic Paradise has been improved. The Leprechaun has been redrawn and some of the RP payouts have been increased. We have removed Newspapers, Magazines, Plates and Photos from being asked by most quests. There is also less chance of being asked for 3 items from this quest. The Balloons shop now has a new shopkeeper. There are also 42 new balloons now restocking. The Lottery has been drawn for this week. Imported is the winner of the 78,200MP Jackpot with the winning numbers of 4, 7, 9, 3, 1 and 2! Congratulations! Last Week's Raffle has now ended. pim1212 is the winner of the Red DNA and 100,000MP prize with the winning raffle ticket number 3664! Congratulations! Make sure you buy your tickets for today's raffle - only 10MP per ticket! The new Libra Treasure Chest has been added to the Account Upgrades page. You can open this item to receive 5 random new libra themed items, including new clothes, shoes, wig, weapon, minipet and contact lenses. There are 14 new items avaliable from this Treasure Chest. This will automatically retire April 13th. Queen Eleka has joined the King by ordering the National Maradan Bank to open a new RP Bank in Eleka's Castle. You can now store your RP in this bank and collect daily interest. The Azul and Fasoro can now wear the Panda Costume. The Homeless Fairy has just been released in the City of Marada. This fairy was once a budding fashionista and newspaper reporter, until he lost everything when Zetzilla attacked. Forced onto the streets, he's just trying to find his next big story to get him back in the limelight. He rewards pets who have read lots of Newspapers these prizes he has lying around. A new Weekly Quest Challenge has just started. This week's quest game is Robots. The challenge is to complete as many of these Quests this week. The top 3 players at the end of the challenge will receive a Bee Costume, 200,000MP and a Gold Trophy, the next 6 players will receive 150,000MP and a Silver Trophy and the next 9 players will receive 100,000MP and a Bronze Trophy. King Baspinar has ordered that the National Maradan Bank open a new BP Bank in Baspinar's Castle. You can now store your BP in this bank and collect daily interest. These new Phanty Plushies have been released. You can win these as prizes from the Trunx Theatre missions. A new Monster Account Upgrade has just been released. The main prize is a new Wand of Monsterous Power, currently the strongest healing weapon. You will also receive a monster themed cd, dvd, potato, pearl, trading card, stamp, minipet and costume. Can you find the new 'Monster' Hidden Avatar? The Chibs, Renat, Tantua, Rofling, Viotto, Vixen, Willa and Xoi can now wear the Monster Costume. A new Weekly Battle Challenge has just started. This week's opponent is Reisand, you will need to have a Reisand Trading Card in your Battle Deck. The challenge is to win as many battles against this opponent this week. The top 3 players at the end of the challenge will receive a Plutonium Trading Card, 200,000MP and a Gold Trophy, the next 6 players will receive 150,000MP and a Silver Trophy and the next 9 players will receive 100,000MP and a Bronze Trophy. Happy St Patrick's Day! 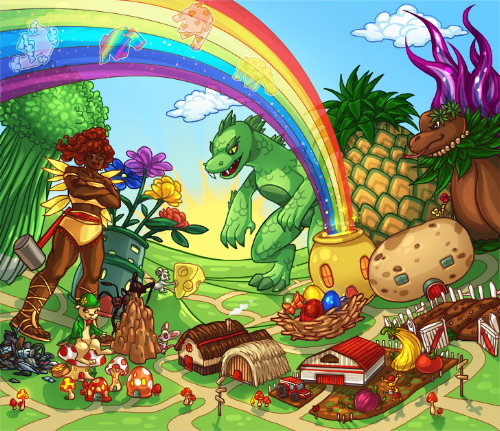 To celebrate, the Leprechaun is trying to beat the world record for the most items donated to the Pot of Gold in 7 days. From now until March 24th, you may randomly win one of these new prizes every time you donate an item. You cannot donate any items above Rarity 15. At the end of the event, the Top 100 donators will receive a new prize and 1,000,000MP. And 10 lucky random players will receive a retired Leprechaun Costume - the more you donate, the more chances of winning! Happy St Patrick's Day! A new EVENT will start later today. 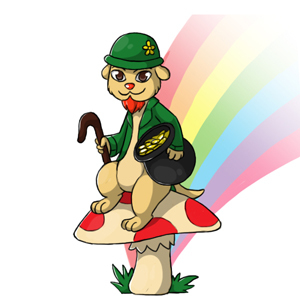 These new Leprechaun Pets have been released. The Chibs, Crindol and Lorius are new and the others are redraws. The Lottery has been drawn for this week. 1MaRaPeTsfOrEvEr1 is the winner of the 51,000MP Jackpot with the winning numbers of 11, 8, 2, 23, 24 and 9! Congratulations! Last Week's Raffle has now ended. freakyteen16 is the winner of the Red DNA and 100,000MP prize with the winning raffle ticket number 3512! Congratulations! Make sure you buy your tickets for today's raffle - only 10MP per ticket! The Queen Eleka Loyalty System has new prizes added. Every unique day that you log in and play Marapets she will count it. She now awards prizes up to 720 days. There are two new Giftbox items on sale at the Account Upgrades page. The Magazine Stand Giftbox allows you to magazines every 30 minutes instead of an hour. The new Missing Wardrobe Giftbox unlocks a new feature in your Wardrobe. You will be able to view all of the items you do not have in your wardrobe, organised by category, with a price check feature and giving you the chance to try the clothes on before you buy them! This is how the Rofling, Viotto and Vixen will look like wearing the new Monster Costume. We have improved the Games page. You can now view all 46 Flash Games and quickly play our Top 12 games. You can also browse all site Games by category. We hope you like the changes! These new Charms are now restocking in Eleka's Castle. Can you find the 'Ouch!' Hidden Avatar? The Hotel in the City of Marada has now been revamped. A new Weekly Quest Challenge has just started. This week's quest game is Farming. The challenge is to complete as many of these Quests this week. The top 3 players at the end of the challenge will receive a Love Costume, 200,000MP and a Gold Trophy, the next 6 players will receive 150,000MP and a Silver Trophy and the next 9 players will receive 100,000MP and a Bronze Trophy.